The script is king when it comes to creating a video. Once you have the words, it’s the pictures that will tell the story. Storyboards are a key component in video production. They serve as a guide during the production process, allowing the video producer to determine how the use of footage, sound bites, audio (music, sound effects, natural sound) and graphics, will effectively communicate the key messages before production begins. Storyboards keep the entire production team on track—videographers and photographers know what footage and photos to capture, production assistants can track down the correct historic images/documents or reach out to local resources to gather canned content, and contractors have a clear direction for their deliverables. This helps reduce overall production costs, cuts down production time and ensures you meet the deadline. Storyboards vary visually—they can resemble a comic book with images and text, they can appear very sleek when created using storyboarding software or they can omit the visuals and just include descriptive text. Storyboards are particularly useful when you’re creating video content with a specific run time, for example, a public service announcement (PSA). The narrator can time out each individual line to gauge the length of a b-roll shot, or time out the entire piece so you know approximately how much footage you’ll need to collect for the video. At the U.S. Environmental Protection Agency, producers in the Office of Multimedia rely primarily on descriptive text in storyboards. The production notes allow us to provide a mental image of what the end product will look like for non-video members of a project team; if a producer is pulled from a project, the storyboard serves as a guide for the next producer who takes on the project. If a contractor is involved in our production process, the storyboard takes the guesswork out of what is expected as a deliverable, saving us time and money on production costs. 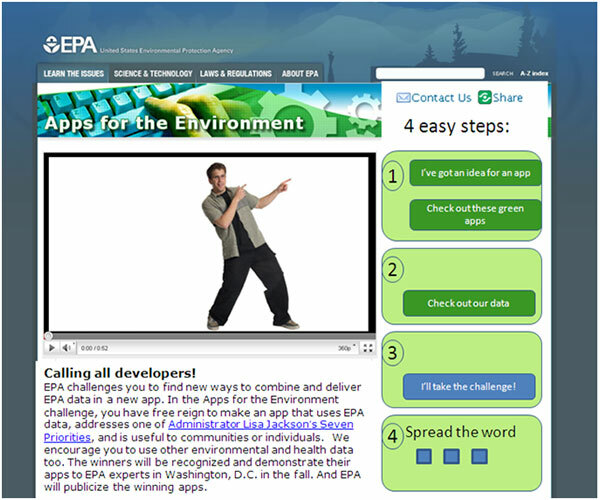 Our “Apps for the Environment” script was unique because, for the first time, EPA planned to tie video content to the creation of a new Web page. The storyboard allowed video and Web personnel to collaborate on a project, then tie elements of their respective content together. When we began working on the script and the storyboard, the Web team had already created a mock up for their Web page (image attached to storyboard). As we identified the key communication messages and drafted the script, we worked with the Web designers to include the same language on the Web page to create a link across both platforms. Once the script was locked, we discussed color schemes and icons. In planning out the graphics for the video, we decided to include a numbering system for the four steps to enter the “Apps for the Environment” challenge in the video, and convinced the Web designers to include the same numeric graphics on the page, creating another link between the media. This video was shot on a green screen, so the storyboard was critical to make sure we captured everything we needed during the few hours we had access to our on-camera talent. “Apps for the Environment” was a video that required kinetic text and animation, techniques we hired a contractor to execute. The details in the storyboard allowed our animation artist to build exactly what we were looking for, without taking away the contractor’s ability to add a little creative flair, like the use of the binary code when transitioning from text to images or the talent to the closing slate. The storyboard allowed us to take the video from script to final product in less than nine days, enabled us to stay within budget by giving clear direction to our contractor, and most importantly, ensured the video turned out exactly the way we planned. Jini Ryan is an Executive Video Producer, in the Office of Multimedia at the U.S. Environmental Protection Agency (EPA). « PolicyOps—A Better Way to Create and Implement Government Policies and Programs?